Subaru utility vehicles have forged a hard-earned reputation for delivering the qualities that discriminating drivers ask for most. All come standard with the world-renowned Subaru symmetrical full-time All-Wheel Drive (AWD) system, which blends genuine go-anywhere capability and pure driving pleasure. Powered by the famed SUBARU BOXER engine, Subaru utility vehicles are also surprisingly affordable, refreshingly fuel-efficient, and incredibly reliable and durable. In addition, this line of Japanese-engineered crossovers (CUVs), wagons and sport utility vehicles (SUVs) boasts exceptional safety ratings. Here it is — the 2019 Subaru Crosstrek, the compact crossover that drives as good as it looks. Although small on the outside, this super-stylish urban adventure vehicle is roomy on the inside. Built on the Subaru Global Platform, the second-generation Crosstrek leaves compromise in the dust with its low centre of gravity, sharp handling, high ground clearance and go-anywhere Subaru Symmetrical Full-Time AWD system. The Crosstrek is a 2018 IIHS Top Safety Pick+** (on models with EyeSight® and specific headlights). Stellar ground clearance – A massive 220 mm for clearing all sorts of obstacles! Generous cargo capacity – Up to 1565 L with the flat-folding rear seats flat-folded down! Strong towing capacity – Up to 680 kg to pull all types of weekend toys! The all-new 2019 Subaru Forester brings more fun and more value than you’d expect. 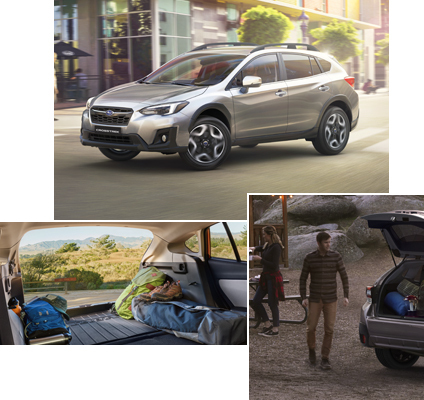 The Subaru Global Platform allows for a stiffer and stronger chassis resulting in sportier handling, a new ultra-efficient CVT delivers remarkable fuel efficiency, while standard X-Mode opens more routes towards adventure. Enhanced visibility, generous interior space and stellar safety systems make this sporty compact SUV a perennial hit with Canadian families all over. 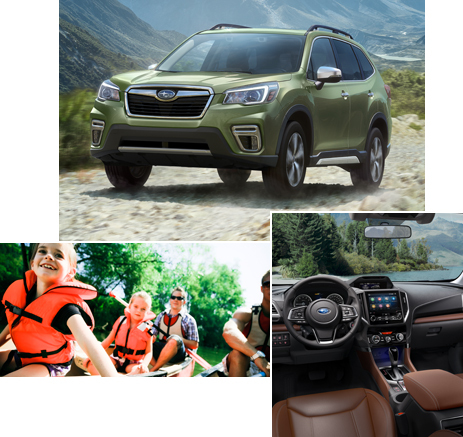 Enhanced Capability – Standard Subaru Symmetrical Full-Time AWD and X-Mode with Hill Descent Control for more rugged, off-road adventuring. Advanced active safety technology like Vehicle Dynamics Control, available Subaru EyeSight® Driver Assist Technology and Reverse Automatic Braking (RAB). Unsurpassed Visibility – Structurally designed to achieve the best field of view in its class, plus a standard rear-view camera. Cavernous Cabin and Cargo Area – Generous elbow room for 5 adults and up to 2155L of cargo space. If you're looking for car-like driving dynamics combined with SUV-like utility and sheer rugged capability, then look no further. 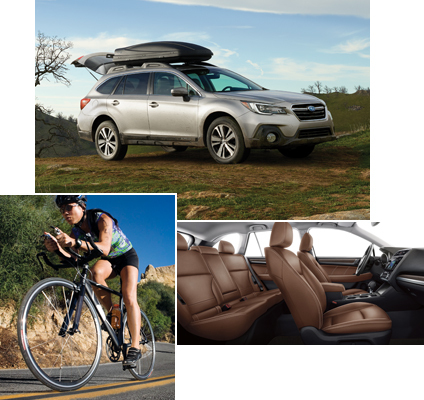 The mid-size 2019 Subaru Outback is a unique SUV alternative that freely mixes business with pleasure, whether you're running errands around the city, headed out of town or headed way out of town over rougher terrain. The Outback is a 2018 IIHS Top Safety Pick** (on models with EyeSight® and specific headlights). Solid towing capacity – Up to 1224 kg for hauling all manner of trailers! Lofty ground clearance – 220 mm is the height needed for rough-road adventures! 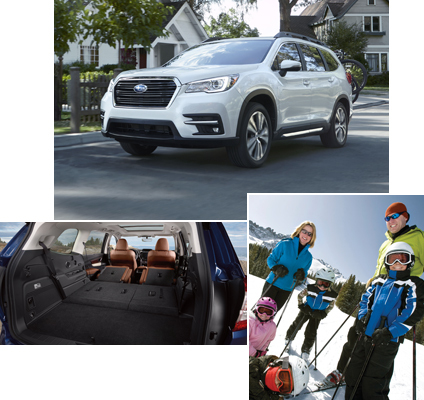 Built on the all-new Subaru Global Platform, the Subaru Ascent is the three-row SUV that’s engineered for family-sized adventure and supreme comfort. Standard Subaru Symmetrical Full-Time AWD, X-MODE and Active Torque Vectoring create genuine go-anywhere capability and heighten active safety standards. The award-winning Subaru EyeSight® Driver Assist Technology brings increased safety into sharp focus. To top it off, the Ascent features seating for 7 or 8 passengers, cavernous cargo space and a generous towing capacity. Solid towing capacity — Up to 2270 kg for hauling all manner of trailers! Generous ground clearance — 220 mm is the height needed for go-anywhere adventures! Voluminous cargo capacity – Up to 2449 L with 2nd and 3rd row seats folded flat! **To determine crashworthiness, IIHS rates vehicles good, acceptable, marginal or poor, based on performance in five tests. To qualify for 2018 Top Safety Pick+, a vehicle must earn an acceptable or good rating in the small overlap front (passenger-side) test and good ratings in the small overlap front (driver-side), moderate overlap front, side, roof strength and head restraints tests. Vehicles must offer, as optional equipment, an autonomous emergency braking system (Subaru EyeSight®) and earn an advanced or superior rating for front crash prevention. Vehicle must also offer specific headlights that earn a good headlight rating. For more details, visit www.iihs.org. † Fuel consumption ratings reflect the Government of Canada's new test methods for 2015 models onwards. For details, visit www.nrcan.gc.ca. Your fuel consumption will vary depending on how, where and when you drive. 22017 Canadian Black Book Best Retained Value Award winner - Compact Car category. Based on value retained from original MSRP for 2013 model year vehicles as published by CBB, as of January 1, 2017. See www.CanadianBlackBook.com.